One of the major deciding factors to answering the question, How was your travel trip? largely depends on the hotel that you choose to stay, I am sure you all agree. It is one thing that can make or mar your trip, polish it or blur it towards oblivion. 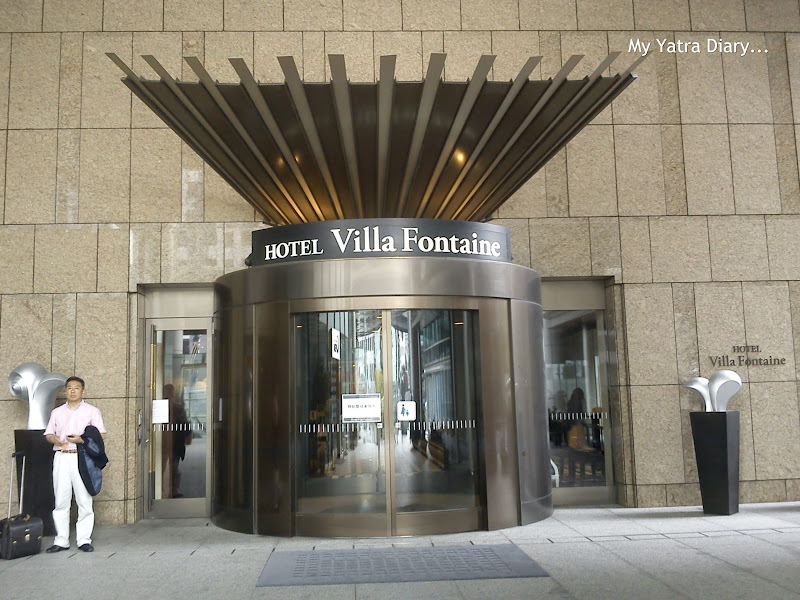 Which is why I was so eagerly looking forward to the Hotel Villa Fontaine Roppongi in Japan booked for me by the travel company, Expedia! And I don’t know if I am doing it right in disclosing this beforehand, but Hotel Villa Fontaine Roppongi did score excellently well on my scorecard. At first glance itself, the hotel spelt luxury. 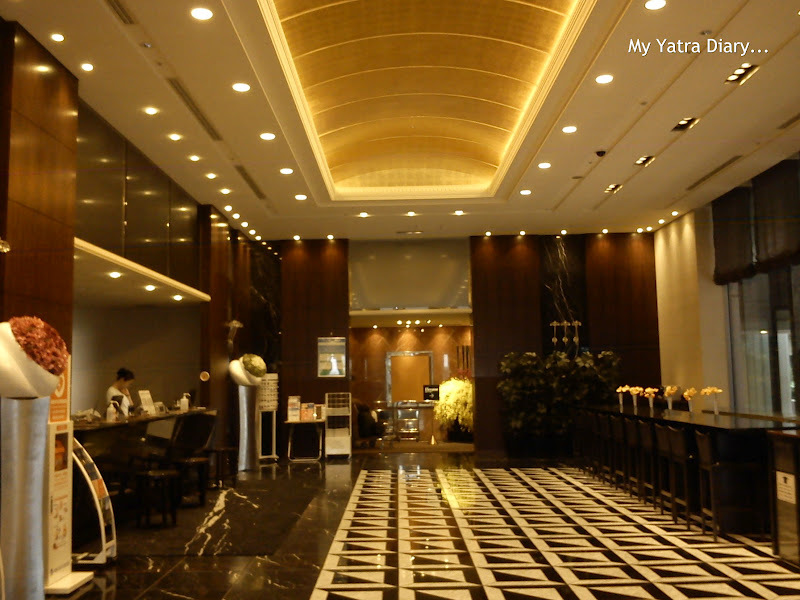 The lobby was spacious, well lit up with a pleasant and an obliging English speaking front desk. the reception on the left and the breakfast area to the right of the picture. In one part of the reception area, there was a complimentary buffet style breakfast to start the day that came along with our room price. Quite elaborate with a wide range of exotic items like miso soup, rice, yoghurt, salad, different types of bread, milk, orange juice, tea, coffee; the lavish spread was an absolute treat to the senses. 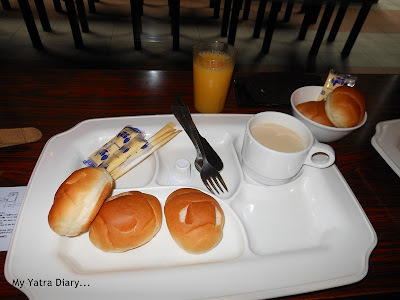 While pure veggies don’t have much of a choice but for us the combination of milk-bread, butter and the orange juice worked wonders and ensured that our day started on a healthy and a filling note. consisting of milk bread, butter and juice. My room had a cozy and a warm set up that came along with a special queen bed. I flopped on it, tired and weary every night and this made it quite hard for me to leave it the next morning. The room was big enough for two people to fit in comfortably and clean enough for a homely stay. They weren’t anything elaborate, just simple and comfortable. The allure of this room, for me, simply lied in its uncluttered details. The amenities in the room integrated a small refrigerator with slip-ons and night pyjamas included. The night pyjamas made for a pretty picture of amusement.. I drank this water everyday. and this proved to be a pretty safe bet instead! Apart from this, the hotel also offered the usual amenities like free wifi access in all the rooms that are the hallmark of every luxury hotel today. -- this was my temporary work area too. but thankfully, Gmail was an exception! So, Should you stay in Hotel Villa Fontaine? Simply because, the 3 days that we spent in the hotel in many ways set up our trip in Tokyo, not only because of its ambiance but because of its courteous staff as well. Voluntarily offering to keep our luggage at the reception area, personally attending us with the subway map route and sight seeing options when asked for and helping us track the veggie options from the breakfast buffet are just some of the things that will ensure that I come back to this hotel, the next time we come to this beautiful city and recommend it to you as well. 1. One thing that you need to be careful of is the check in time. They are quite firm about it and wont allow you in before their predefined point. However, the good side to it is that in case you happen to drop in before time like we did, the staff is helping enough to safely shelter your luggage till you secure your room later. That’s it though, they dont entertain any more requests in this regard, no matter how long your travel has been or how tired you are, and you are left to take care of yourself. Timings: Check-In: 15:00 Check-Out: 11:00. 2. 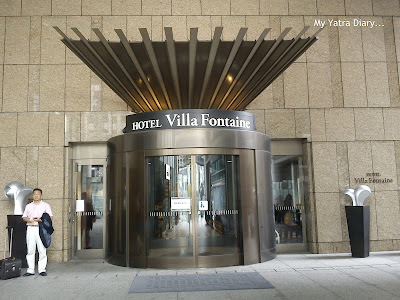 Conveniently located right adjacent to the Roppongi-itchome station, Hotel Villa Fontaine gives you easy access to the subway train network that connects you to the rest of Tokyo. 3. I am not too sure what use addresses serve when trying to reach a place in Japan. My personal experience says that people hardly identify places by their exact addresses. Its better to know the nearest station to your hotel beforehand, well in advance and then ask for the place after alighting at the correct station. 4. Do a thorough research on the web for places to stay before deciding on one especially if you are travelling solo and on a budget - you can find some really cool best hostels to stay for solo travellers in Tokyo. - 8 min. walk from Kamiyacho station. - 8 min. walk from Tameiko Sanno station. - 12 min. walk from Roppongi station. Very interesting and informative. The hotel looks like a wonderful place to stay. Looking forward for the next post in this series. What a terrific hotel, Arti, and what a great, informative post -- as always! I would love to visit there! I worked for a Japanese company in Oregon until I retired and I have many friends in Japan! Enjoy and have a great weekend! wow, very informative post, Arti, love the information you shared and also your selection of food. Look nice place to stay arti. But see the breakfast menu seemed too bland for me, how you can survive "spice lovers"? This looks like a good stay, but I have to say that your meal choices, as a vegetarian, were not so good! Otherwise it looks like a nice place. @Arti Good morning. Thanks for another beautiful post from Japan. Great to read. Love the photographs. Thats a lovely review. The hotel and its failities look great. That looks like a very nice hotel, and I am glad you liked the tap water. When we stayed in Tokyo in 2008, we found that the queen bed was too small for us. Agree. Vegetarian food was hard to find in Japan and since people are not very familiar with the word - pure vegetarian - it made things all the more difficult for us. The vegetarian platter in the buffet didn't have too many options to pick from but still we felt quite lucky to have something at least as against to nothing and whatever little was on offer was also quite good to have. The tap water in Japan is generally safe, especially when they themselves claim it to be. About the queen bed, that is interesting to know. Ours was big and wide enough for 2 people to fit in comfortably... Do you remember the hotel where you'd stayed? How was your overall experience with it? hotels.But,the way you describe about your hotel is superb. Arti,your post is very well advertising the Hotel you stayed. available in all good hotels. I’m proud that Japan’s public transportation system is very efficient, convenient, and punctual. However, I get so confused in Tokyo with Tokyo Metro, Metropolitan Subway, JR... and whatever. I think you know now more station names than I. I’m relieved the hotel staff was a great help. Everything is so neat and clean. Thank you @Rakesh Kumar ji. 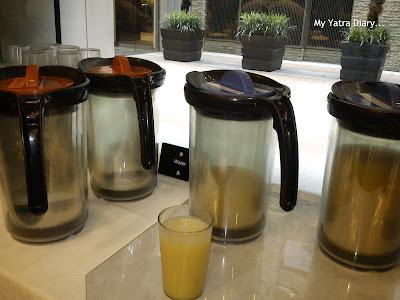 There were no fruits, cornflakes or the like only bread, plain rice (with no curry), salad and beverages available for pure vegetarians in the breakfast buffet. Japan's transportation is really very convenient and I cant stop admiring its efficiency. I myself don't know much of the different train lines but I did manage to get a bit of hang on the subway train route map of Tokyo from second day onwards and enjoyed traveling in the trains after that. What a great hotel! Love the bathroom. Wishing I was there, this looks wonderful. The public transportation system is so efficient in Tokyo but I hear the rush-hour is a nightmare, though I remember your talking about how overcrowded the train in Mumbai is! Anyway it's good that you have a good sense of direction to move around for yourself using maps. Looking forward to your next report. Wow, Roppongi is one of the most posh areas in Tokyo, but taking a close look at the town, it still has kept a local, traditional atmosphere. 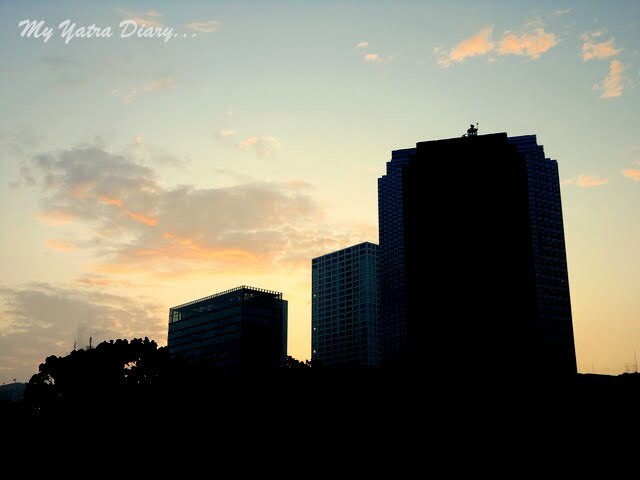 I am very glad to know your travel in Tokyo was quite satisfactory! I have a very bad sense of direction. In Osaka or Kyoto, even Nara, I get lost many times. 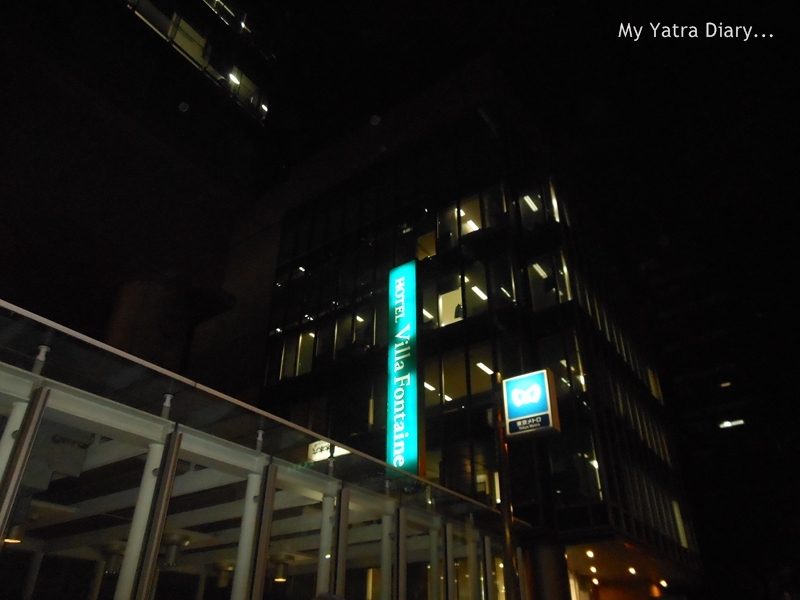 But when it comes to public transportation in Tokyo, they are superb and easier to take a transfer, comparing with public transportation of Osaka or Kyoto. I got lost less in Tokyo. Arti, wasn't you surprised to find how deep in the ground the subway stations are located? I am sorry, I missed your former blogs. I dream of going to Japan. Thank you for bringing us here through your wonderful photos & stories. Looks like a nice,neat,elegant and comfortable place. Oh I love the look of the room - sparse and simple yet with a touch of elegance. You've done a masterful job of relaying your experience and review. I'm thinking I would have a difficult time with the food - I'm not only vegetarian but also I must eat gluten-free food and it seems that would be difficult to find - gluten-free. Thanks for a wonderful tour of the hotel! Happy day to you. Arti, we stayed at the Hotel Pacific in Shinagawa. It was a very nice hotel. I was told later that beds in Japan tend to be smaller than beds in the USA, perhaps because the people are smaller. David is a big man and requires a king size (American) bed. But, we both enjoyed the elegant restaurants in the hotel. The breakfast buffet was outstanding. Definitely a luxurious hotel, Arti. I've never been to one that provides night clothes. What a detailed information Arti! The hotel looks very decent and should've felt good like home after the tiresome day of sightseeing! Wow , everything looks perfect !Smiling at the pajamas.We vegeterians have very limited meal choices when travelling abroad. I love when a really nice breakfast is included. That makes me feel like I'm getting something for my money. And those pajamas are cute. Super luxurious, I will stay there if I ever get a chance to visit Japan. Thanks for sharing Arti! @Shrinidhi Hande Free internet usage was included in our room tariff and it was unlimited to use. @gigihawaii That was interesting to know. Many thanks for sharing. 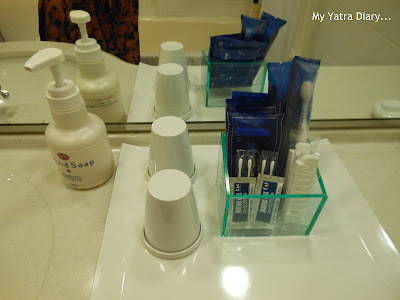 Wonderful post and I enjoyed reading about the Hotel you stayed in. Thanks for sharing and I look forward to seeing more of your trip. I promise to stay there as and when I get to go to Japan :).. The place looks amazing from both inside and outside. The food looks amazing as well. Who doesn't love a nice comfy armchair tour?? Jaw dropping Japan!! No wonder, blogging is amazing for expanding the visual horizons, isn't it? 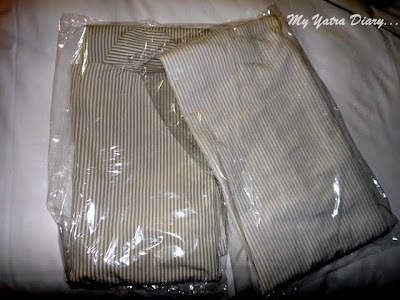 I am so glad with your yatra diary new posts.. I am loving it. Not to say I did not enjoy the older classic posts of yours, but this is entertaining too. You are right Arti. Hotels do matter a lot! And more often than not, it decides our overall experience..
Nice review with a very informative post. Hotel looks like a luxury hotel. Looking forward for more posts of this trip. i always choose hotels that are close to the train station, too. that way i can roam around the city easily. Very thorough! Can't wait to read more. A detailed account and nicely written. Interesting images as well. Since I am planning to go to Tokyo in October, this is of added interest to me. This hotel looks real nice place to stay. nice place to be ... Japan..good pics taken! Ah, Japan..! Did you buy any Japanese doll? Great post ! Considering that this was a contest win ( Wasn't it ? ), I am sure, it would have been even more pleasant ! Inexplicable happiness you have gathered through your lenses. Wow!!! This looks so interesting. The Hotel looks good and neat too. Vegertarian food is indeed a problem there. 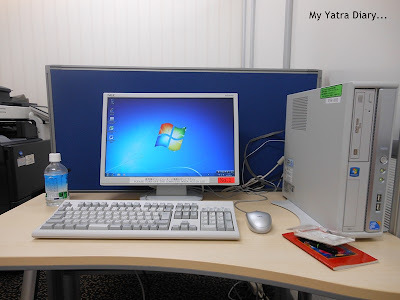 Hi Arti, Thanks a ton for your encouraging words about my blog. You have a wonderful wonderful blog and I have not even covered half of it, it seems like a treasure trove. Your Japan pictures are awesome, and yes I am your next follower and regular reader .. sooo glad to meet you... take care..
but only in my dreams ! I love your blog and how descriptive it is! All the pictures and information are really helpful. Thanks and happy travels!! You know, I just love that there are people who writes good stuff. That hotel looks amazing within the way to describe it. BTW what's INR equivalence of an yen? @Anunoy Samanta 100 INR ~= 150 JPYen and yes, the hospitality is indeed amazing! Looks like a lovely hotel! And Miso soup for breakfast?? LOL! I love the cute little sign on the water tap, and the pyjamas, what a sweet little touch! I love hotels that add little nitbits like that. Needless to say, you had a fabulous time, didn't you?